91 Days to 91!!! Come join the birthday bash in Carmel! This will be a great time! Happy 91st birthday Doris! Love your movies since With Six You Get Egg Roll- 1968. You are an inspiration with your beautiful voice and have worked with gorgeous leading men! 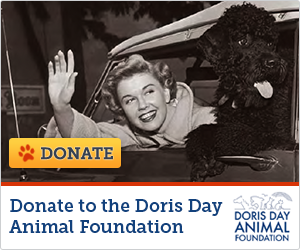 Doris, your love for animals and the wonderful things you have provided for them. You and Betty White are the Golden Girls for your generosity and humbleness. My mom loved your movies and she would be 97 this year! hope your 91st is GREAT and so many more! Would so love to attend this!!! How much do these birthday activities cost? Are there any hotels giving special rates? You would have to email the contact on the poster, wandahewer@gmail.com for that info. We advertize here as a courtesy. Doris: Do you realize that you are just as much loved and respected today as you were during your Hollywood years? We have not forgotten what made us love you in the first place. Happy 91st! I remember you when I was a little girl, your love of animals and your song Que Sera Sera. You haven't changed a bit! That song you coined as your own certainly is true and has made an icon out of you. You are a beautiful person Doris Day! Que Sera Sera!